It’s 7:30 a.m., and I’ve only had two sips of coffee. This might explain why I walked four blocks past my destination. The front door swings open and I sheepishly explain my tardiness due to the eight-block-in-total additional excursion. Once inside, scattered about are the usual suspects in terms of tools of the trade: a grain mill, brewing malts, yeast samples. 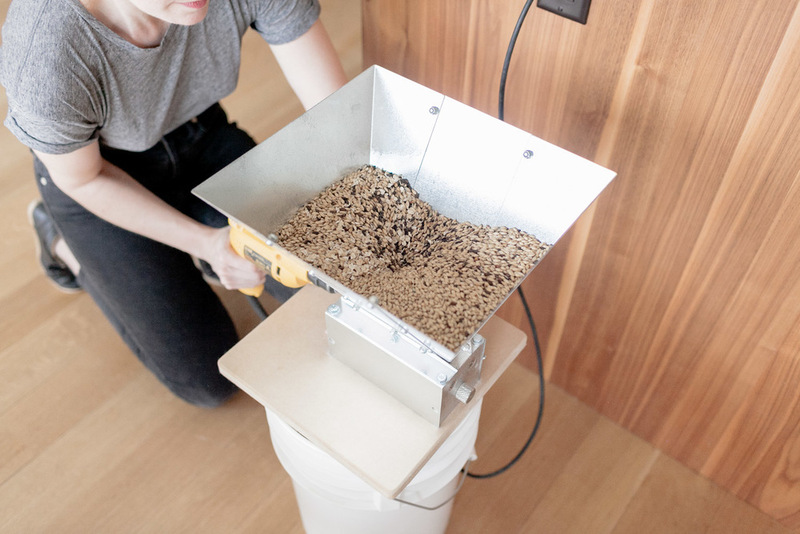 Brewing terminology is tossed about as the boil is started, and I watch as barley is milled. It all seems part and parcel to the beginning of any day in a brewery. Only I’m not in a brewery. I’m in someone’s home; in their kitchen, to be exact. And I’m watching as a husband and wife team get to work on the pilot batch of a variation of their imperial stout that’s already taken home two medals at the Great American Beer Festival. That’s exactly how many times it’s been entered. Joe and Lauren Grimm have been brewing their beers, Grimm Artisanal Ales, much the same way for years — that is, five gallons at a time. Only these days some of those recipes get scaled up to a commercial batch that's brewed at either Flagship Brewing on Staten Island or Beltway Brewing in Sterling, Virginia. Their interest in fermentation didn’t begin with beer, though. “We were just excited about making everything at home. Joe and I were making soap and our own pickles,” says Lauren. This was around the time they were students at Brown University in Rhode Island, but things got more serious when Joe and Lauren moved to Chicago, where they continued their studies at The School of the Art Institute of Chicago. They got involved in the art community and began doing pop-up bars, providing their homebrews to the various gallery openings. “There was this amazing reception, people were really excited about it. Some would say they came to the show just to try our homebrew.” Based on this enthusiasm, the two began thinking about how to take their beers out of the “not quite legal” gallery sales and move them beyond five gallons. 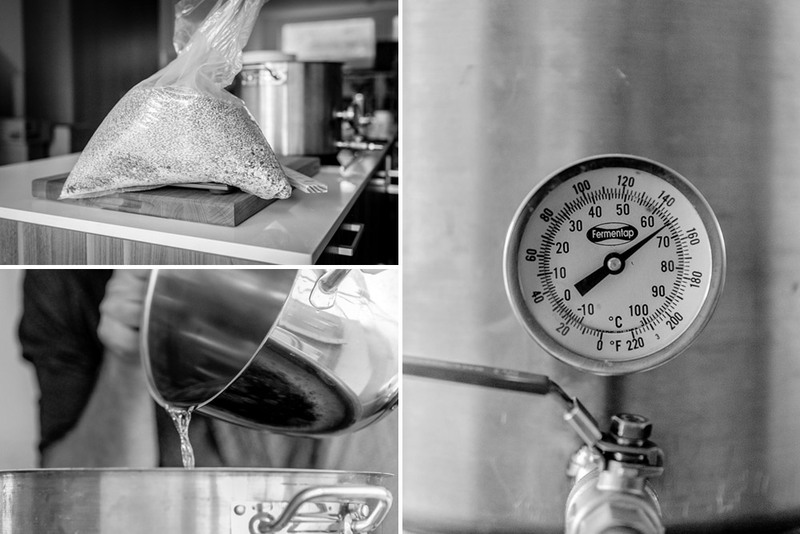 The seed had been planted, and Grimm Artisanal Ales would soon be born. The two have long been involved in the arts and creative community: Joe as an experimental musician playing solo as well as with a host of indie bands, Lauren as a conceptual artist working mainly in sculpture. When asked what they’d be doing if they weren’t brewing, Lauren explains “probably working odd jobs, making art work, and spending a lot of time in our studios.” But the analog is pretty seamless when you think about it — kitchen as studio, recipe as canvas. It’s tough to beat a well-made breakfast sandwich, and it seems every New Yorker has their “go to” spot for one. To kill time while waiting for the water to come to a boil, we head over to a local favorite of Joe and Lauren’s, Court Street Grocers. A quick walk down the block and across the Ninth Street Bridge, and we’re suddenly in another neighborhood. In this part of Brooklyn, BoCoCa — a portmanteau word for Boerum Hill, Cobble Hill and Carroll Gardens — happens that quickly as three neighborhoods are tightly packed into a relatively small geographical area. Though not technically on a corner, Court Street Grocers is the epitome of a corner grocery store. Simple sans-serif type above the entryway, an air conditioning unit perched precariously overhead as you enter. Inside it’s so narrow that you can almost stretch your arms out and touch the walls on either side. These types of stores are everywhere in Brooklyn, dotting the corners of every neighborhood, providing everything from necessities to, in many cases, a respectable selection of craft beer. But we’re here for what Joe and Lauren have led me to believe are some of the best sandwiches around. With orders placed and breakfast now in hand, we head back to check on the water. On our way back, we pass a warehouse space on their block that, at one point, was under consideration as a possibility for their brewery. “The commute would have been the best part of that space, living just a few doors down from it.” Ultimately it didn’t work out, but it strikes me that for even as large as Brooklyn is, it can sometimes feel small, even quaint. People don’t really need to venture outside their small radius unless they choose to do so. Our morning jaunt a case in point: within just a few blocks, we had procured breakfast sandwiches, passed a warehouse space large enough for a brewery, and ducked back into the Grimm’s apartment — all on the same street. Incidentally, that space would have been a welcome addition to the brewery scene in this part of Brooklyn, joining Threes Brewing and Other Half, both in the vicinity. It’s a beautiful, mild morning, so we retreat to their deck overlooking a sizeable backyard by New York City standards. Lauren is all smiles with an infectious laugh, her exuberance for what they’re doing palpable. Joe’s contributions are thoughtful and direct. Together, the pair seems to complement each other perfectly, picking up where the other leaves off, both excited to tell the Grimm story. The Pulse Wave we pour is delicious — a tropical fruit bomb with a nice dose of bitterness on the back to balance it out. Grimm has garnered some attention lately with their IPA offerings. Taste test articles on the web are not only increasing in frequency, but seemingly deflating their credibility with each subsequent posting. With that said, a recent blind taste test looked to wrangle and rank 115 double IPAs, no small feat. Land in one of the top ten spots and you’re in rarified company. Grimm landed two double IPAs in the top five — Tesseract and Lambo Door, which is loaded with Citra, El Dorado, and Simcoe hops. While their IPAs may shine, equally impressive is Grimm’s sour ale output. Recently they’ve gone on a stretch of producing dry-hopped, oaked sours and goses that have not only been delightfully tart, but infinitely crushable. Super Symmetry, a dry-hopped, oaked gose with lemon zest, and Rainbow Dome, a dry hopped, oaked apricot sour ale, both speak to the Grimm’s affinity for experimentation within the style. And if those weren’t enough, their stout is no slouch either. Double Negative garnered Grimm a silver medal at the 2014 GABF and managed to improve on that, taking gold this year. That doesn’t mean significant change from an offering standpoint. Their goal is to keep brewing their current line, but also add the beers they’ve always wanted to create but were unable to do so with the contract set-up. “We’re definitely going to keep doing what we’re doing now, but what we also want to do more of, that we can’t currently do, is spontaneous fermentation. It would be fun to do New York terroir, New York microbiology versions of that kind of stuff.” These are the types of projects Grimm hopes to take on as they get their brewery set up. They’re currently vetting spaces with no real timeline of when it will officially open. “No set schedule, but with that said, as soon as possible,” Lauren says with a chuckle, the anticipation of getting their brewery up and running clearly evident. It’s at that point the conversion will be complete. Perhaps the next time we catch up with Joe and Lauren, we’ll be surrounded by the familiar stainless steel tanks and tap handles that are so ubiquitous in the breweries of today. But until that time, hearing the story of how a couple that started brewing beers in a college apartment went on to start a brewery that would medal at GABF, all while brewing a pilot batch in their kitchen with their cat Coda pitching in to help when required, was a pretty unique experience. As with much of what Grimm Artisanal Ales has done, there was no master plan. It happened organically. Joe and Lauren steering their brand with their personal desire for what they want Grimm to be as their compass. Is an operation like Grimm indicative of a future for small start-ups? Is it a weird little branch on the evolutionary of craft beer? Or is it simply a moment in time, made possible by the constraints and creativity of two individuals who wouldn't have done it any other way? It's hard to tell — but it's certainly interesting to witness. As I exit, I notice the contrast of their cozy, quiet apartment with the chaotic Brooklyn street just at the end of their residential block. As I walk away, I see scores of neighborhood bars on as many blocks, and momentarily feel as if I’ve just exited one of them. In reality, I’ve just left the beginning of a beer’s journey rather than its destination. One that started on a stovetop in a Brooklyn apartment, and wowed the world of craft beer.